There are lies, damned lies, and anglers. I am one of the later. Signed, sealed and delivered into the piscatorial art for nearly six decades. Beyond all hope; which is why living and working in North Sutherland is the only place for the likes of me – plenty of room to go fishing. 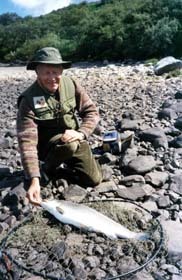 If I were I to live several lifetimes it would still not be sufficient for me to explore and properly appreciate all this amazing land has to offer in regard to fishing for salmon, sea-trout and brown trout. Best of all, in my opinion are Scotland’s brown trout, wild creatures that have been present in our lochs since the end of the last Ice Age, a precious, irreplaceable treasure. 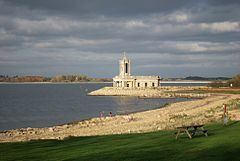 As a resident of Tongue, my annual permit costs me £15.00 per season from the local angling club. Visitors pay about the same per day, but, whatever, it is value for money fishing the likes of which is not available anywhere else in UK. For instance, a day on a famous English chalk stream such as the Test or Itchen could set you back upwards of £100.00 per day. 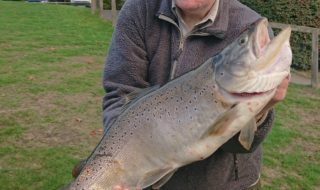 For that you might find yourself fishing for stocked, hatchery-reared brown trout and foreign rainbow trout: bag-limit, 4 fish and when you have them you stop fishing. Most of Scotland’s wild brown trout fishing is readily available to local and visiting anglers alike. 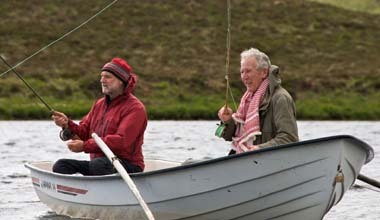 The Scourie Angling Club issues visitor permits on 30 waters. Several hundreds of the Westminster Estate lochs, now covered by a Protection Order are also open to the public on payment of a small fee. At Lochinver, there is years of exciting fishing from the North Assynt Estate and from the Assynt Angling Club, again at a very reasonable cost. You will be made more than welcome by the Lairg Angling Club; the Club has fishing on Loch Shin and a number of other classic trout lochs. The same applies to the angling clubs in Dornoch and Golspie and on the Kyle of Sutherland. Show up, pay up, fish in a proper manner, with rod and line and fly, and you will be welcome anywhere in the far north. The lovely River Spey at Craigallachie. One thing you will not be see are loads of other anglers. More often than not you will have a loch to yourself for the day. 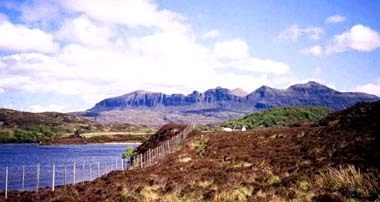 This is especially true if you are prepared to tramp out into the hills to explore the distant lochs and lochans that nestle on our moorlands and on the slopes of our grand peaks; by Suilven, Canisp, Ben More Assynt, Quinag, Foinaven, Ben Hope and Ben Loyal. What you will see, however, are red deer, otter, wild cat, golden eagle, buzzard, peregrine and raven; rare black-throated and red-throated diver, golden plover, curlew and greenshank; an endless variety of wildflowers including rare orchids and, on the north coast, the unique Scottish primrose, primula scotica. Lochan an Iasgaich on the River Inver, Assynt. Across the broken waters of the Pentland Firth lie the Orkney Islands and, 100 miles further north the Shetlands. To the west, over The Minch are the long islands of the Outer Hebrides, Lewis, Harris, North Uist, Benbecula and South Uist. You really have to seem them before you can properly appreciate the hundreds of lochs that await the arrival of your well-presented fly. North Uist seems to be more water that land where some of the larger lochs are scattered with islands that have their own small lochans. You will find the same amongst the Inner Hebrides, in the misty island of Skye, Mull, Jura and Islay. And, always, in Scotland, you are aware of the nation’s turbulent history, clan feud’s, battles and the rebellions that make Scotland’s Story. Falls Pool, River Forss, Caithness. Salmon fishing is also widely available, although success it this art has more to do with luck than with skill. 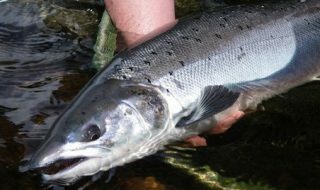 Some may disagree, but when it comes to the removal of salmon from their natural habitat I believe that the all-important factor is simply being in the right place at the right time: when water level, air temperature and weath­er conditions, and whatever other Gods that rule the salmon angler’s fate encourage the fickle beasts to grab an artificial fly. Therefore, it is often advisable to wait until the river is in condition before booking. 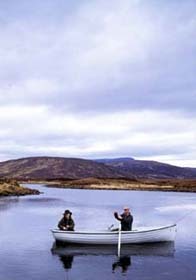 Given that most salmon fishing is reserved well in advance this might seem foolhardy, but there are locations where an instant booking is possible, particularly in the north where the price of a day’s fishing will not cost you an arm and a leg or engender serious disagreement with your bank manager. Fishing the lovely River Spey at Craigallachie. 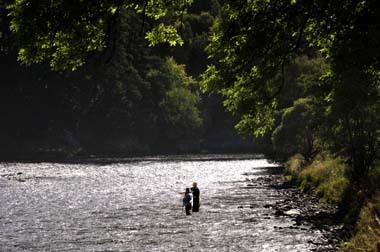 The River Spey has readily accessible salmon and sea-trout fishing (Grant Mortimer’s, tel: 01479 872684).The Town Water of the River Ness and Loch Ness, available to visiting anglers on a day-ticket basis (Grahams, tel: 01463 233178). 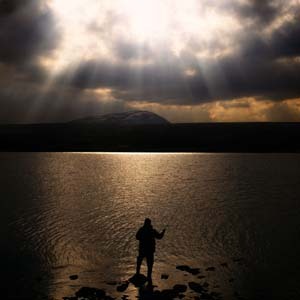 The rivers Nairn (Fraser’s, tel: 01667 453038) and Lossie (Angling Centre, tel: 01343 547615) can give great sport. Day tickets of the lower reaches of the River Beauly to the north of Inverness (Morison’s Ironmongers, tel: 01463 782213). The association water of the Naver (The Store, tel: 01462 07) and the Helmsdale (Helmsdale Fishing Tackle tel: 01431 821372). 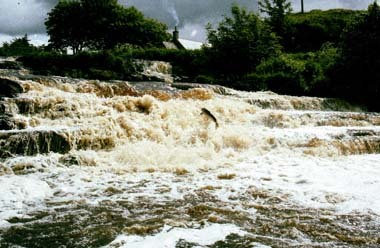 Also in the far north, the River Wick in Caithness (Hugo Ross, tel: 01955 604200); the river is very much a spate stream, but in recent years it has produced upwards of 1,000 salmon. The only problem that you will face is deciding where to begin and in that connection you could do a lot worse than having a look at my book, The Rivers and Lochs of Scotland. It is the result of a lifetime fishing in Scotland and describes in some detail almost 5,000 rivers and lochs; their locations, where to obtain permission to fish, what to expect when you get there and a guide to what flies and tactics to use. No matter where you go, or whether you fish for salmon, sea-trout or brown trout, take care of this precious resource to make sure that those who come after us will find it in good heart, able to give them the same joy that it brought to us. Bruce Sandison’s Rivers And Lochs Of Scotland 2013/14 Edition is available at £14.99 from June 20th, 2013 and describes more than 5,000 freshwater fishing destinations complete with access details, flies and tactics and where to obtain permission to fish.